Sandwich Children’s Center is a non-profit early-learning center for children aged 6 weeks to twelve years. The Center is open year round, Monday through Friday, from 7:15a.m. to 5:30p.m. Drop-off and pick-up times vary with families’ schedules. We also offer full-day programs during school vacation weeks, holidays during which the center is open and summer vacation with our Summer @ the Center program. The Center has separate curricula, classrooms and outdoor playspace for infant/toddlers, preschoolers, and children who come after school. 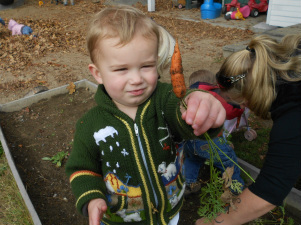 The programs provide plenty of time for free play, both inside and outside, as well as time for directed, intentional learning. Each week there is a designated theme, such as pollination or shapes and colors, which the children explore in different ways. Fun, imagination and discovery guide the curriculum and the teachers have the freedom to respond to the children’s specific interests. The programs also include a monthly visit from a staffer at Squam Lakes Natural Science Center who brings an animal to the Center for a lesson on a specific topic, such as defense mechanisms or nocturnal creatures. The Center employs experienced, caring teachers and has excellent teacher-child ratios. We pride ourselves on keeping our ratios above the state requirements, which means that we have fewer children with each teacher. Most importantly, the teachers really enjoy working with young children and delight in watching them discover, grow, create and learn.